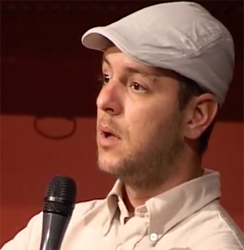 Borislav Sandov is currently the co-chairman of the Bulgarian Green Party, known as Zelenite. At Sofia’s St. Kliment Ohridski University he was vice-chairman of the Student Committee. Sandov now co-ordinates the Bulgarian movement for food independence and climate justice. He is active on the committee of the Bulgarian Climate Coalition, the Anna Politikovskaya Association of Free Speech, GMO-free Bulgaria, Bulgaria without cyanide, Fracking-free Bulgaria, Bulgarian anti-nuclear citizens, BeleNO! and many other organisations. Sandov works in the Bulgarian Foundation for Environment and Agriculture and has been involved in the organisation of several widescale protests against genetically-modified organisms, shell gas, deforestation and the traditional, since 2009, civil protest of January 14th.